After almost two years of planning, the call box restoration project took off in November 2014. 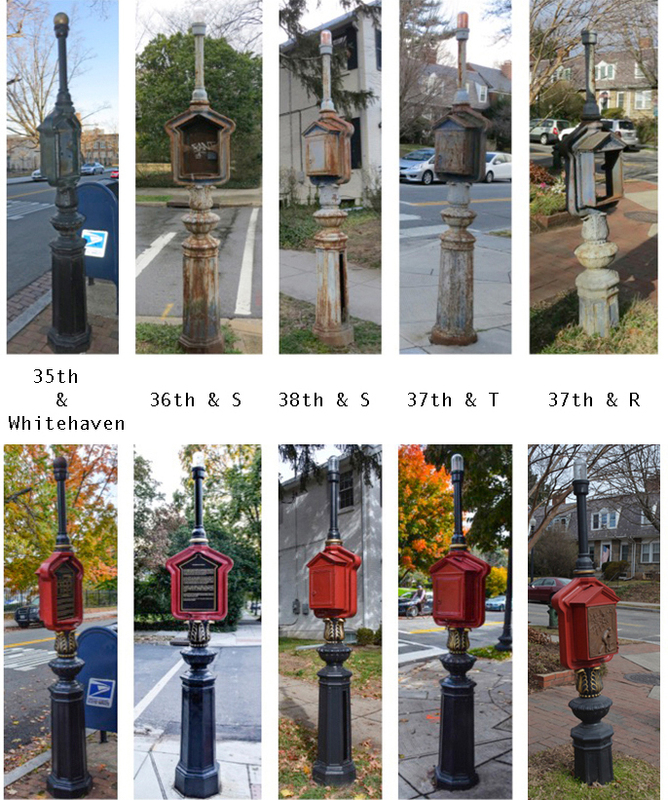 By January 2016, Burleith's five deteriorating fire call boxes were restored to their original splendor, preserving a precious part of Burleith's history while beautifying and enlightening our community. As in other DC neighborhoods, call boxes became obsolete when the 911 emergency call system was introduced in the 1970s. A priority of then-BCA president Nan Bell (2013-2014), the restoration project was spearheaded by the Burleith History Group headed by Ross Schipper, with initial planning beginning in March 2013. Ross's May 2013 Burleith Bell article on the history of Burleith's call boxes raised awareness of these deteriorating neighborhood icons. Other preliminary activities included investigating help from Cultural Tourism DC's Art on Call program, procuring city permission to proceed, attempting to strip a very small portion of one call box (the result of which made it clear that professional help was needed for the restoration itself), identifying vendors to do the work, and developing a cost estimate. Fundraising. With support from Art on Call no longer possible, donations to the Burleith Community Fund for the estimated total restoration cost of $13,500 were solicited. The fundraising campaign kicked off at the November 2014 BCA annual meeting. By the end of 2014, nearly 60% of the goal was raised; by June 2015, 90% was collected. The goal was reached by a contribution made at a donor recognition event in October 2015. All of the restoration costs were completely covered by 100 Burleith residents and friends, a testament to the neighborhood's amazing generosity. Completion. Restoration of all five call boxes was begun and substantially completed during 2015. Four of the five were completely finished by October 2015, and all but the final attachment of the plaque and bas-relief sculpture for the last one was finished by the end of December 2015. The last one—affectionately named "Shorty" on the northwest corner of 37th and R Streets—required more repair than any of the other call boxes. Besides having sunk more than two feet into the ground, Shorty was missing a plate on its pedestal, the glass globe on the top of its light pole, and the door with the keyhole that allowed residents to summon the fire department in case of an emergency. The missing door was replaced with a bas-relief sculpture designed, sculpted, and produced by Burleith artist Jeannette Murphy depicting the Western High School Cadets and the spy Aldrich Ames. Attaching the plaque and bas-relief to Shorty had to be delayed until January 2016 to assure warm enough weather to allow the glue to cure. The Burleith call box project was officially completed on January 31, 2016, with the final unveiling on February 20, 2016. A time capsule created by 14-year-old Max Langenbacher was inserted into the call box at 36th and S on April 1, 2016, to be retrieved by a future generation of Burleith residents. the completely restored shorty at its unveiling on february 20, 2016. Among those present at the ceremony who worked on the project were Linda brooks and Ross Schipper (far left), Jeannette murphy (front center, on grass), edgar russell iii (just right of shorty), dwane starlin (black hat, third from right), and rebecca peterson (far right).